The weather in my neck of the woods has been consistently bad, or at least bad enough, that night take offs and landings (which is my next real-world lesson) have been off the books from a safety perspective whenever we’ve tried to go up. It’s been about three weeks since my last flight, and I realized today that I should be working a bit harder to keep to my aviation studies. So I decided to load up the sim and fly the PilotEdge I-1 rating, which is the ILS 20R arrival into John Wayne / KSNA. I’ve already completed this training, but it was a while ago, and I thought some instrument practice today would be good for the brain. Weather at KSN was VFR with broken clouds around 3,000, so I resolved to take off and then look only at the instruments until I was at 300 feet on final approach (the real-world minimum is 255). Things went fine, I showed up in front of the runway where I was supposed to be, and it felt remarkably like real-world hood work minus the G-forces. So this was good, it felt like practice, and I think I’ll start to pursue the PilotEdge I ratings in earnest as a way of keeping my head in the game until the weather improves. Next up is a short IFR flight from KSNA to KCRQ. 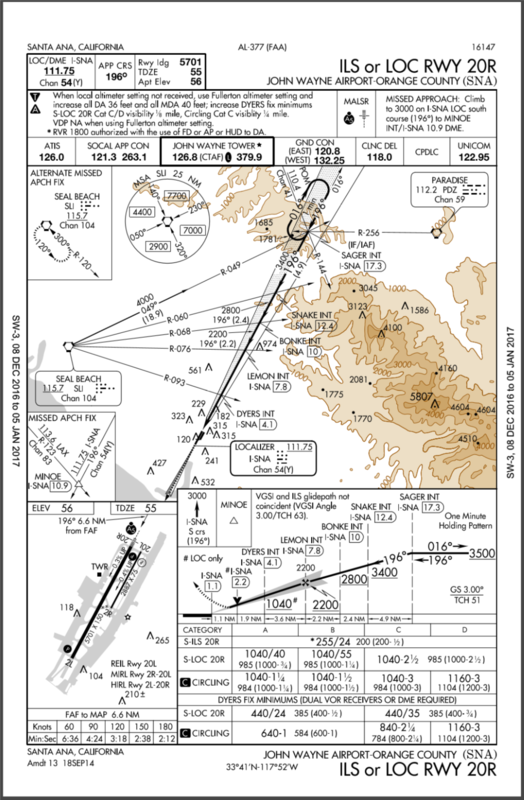 Here’s the KSNA 20R ILS procedure for those who are curious.